At the moment there too much phone cases out there especially in Hong Kong you will find ever stores who are specified selling just phone cases. However at the moment the only function to those cases are that they protect the phone when it fall and also decorate the phone so it differs from others do you could easily identify your own. However as trend standard cases kinda coming to a halt as it is just now producing only new graphics. However the new trends will be adding more function than just only design. As out there now there are cases which include an external battery to recharge your phone or extend the battery life. As people using their phones like crazy use up allot of the power pretty quick. However some of them are quite huge and allot of them don't have much different designs to choose from and mostly be just the same version for sell now, but future trend these covers be low cost to produce and have more designs and graphics to choose from. Concept below is my personal view and will see it happen soon people add an extra compartment with the phone as I have notice people kinda already doing this. Allot of girls who are going out to party often only carry a phone and a wallet some just even only have a phone and money hidden under the phone cover for paying stuff and transport. As thin money would easily fit, but what if the compartment was bigger so you could put more in there or have it as a card holder. 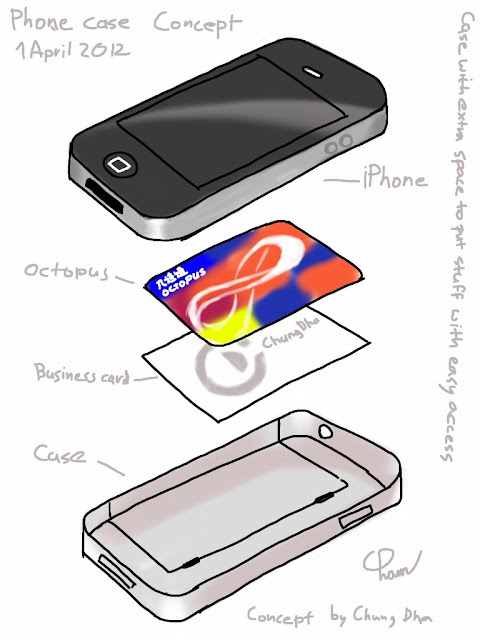 As at the moment in Hong Kong there is no tech yet to pay for stuff by phone but mainly by octopus card which wirelessly transfer money just by waving it over the scanner so a phone case with this built in be ideal too. Another be that the back of the cover is very much a wallet you can open and close to put stuff in of course it should not be too big as the phone with cover should be easily put into your pockets.